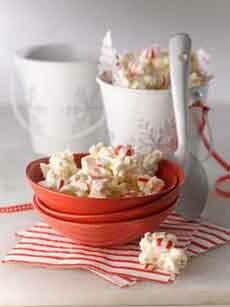 Popcorn, peppermints and white chocolate: Yum! Photo courtesy Popcorn.org. We enjoyed this confection so much at a holiday party that we asked for the recipe. Turns out it’s from Popcorn.org, the consumer site of The Popcorn Board. And it’s easy! Make it for gifts, for your guests and for yourself! Also take a look at this recipe white chocolate peppermint pretzels. *We use Guittard white chocolate chips or chop Green & Black’s or Lindt white chocolate bars. We avoid white candy coating because it substitutes vegetable oil for the cocoa butter in real chocolate (and that’s the reason many people dislike “white chocolate,” as they’re actually eating white candy coating). 1. COVER a baking pan with foil or wax paper; set aside. Place the popcorn in a large bowl; set aside. 2. MELT the chocolate in a double boiler over barely simmering water, stirring until smooth. Alternatively, melt according to package directions. When the chocolate is melted, stir in the crushed peppermints. 4. BREAK into chunks for serving. Store in an airtight container at room temperature. 1. OMIT the candy peppermints. 2. MIX ½ cup dried cranberries and ½ cup sliced almonds with the popcorn. You can also sprinkle chocolate chips over the popcorn. Pour the melted chocolate over the mixture. Popcorn was first popped at least 5,600 years ago in Mexico, by throwing corn kernels on sizzling hot stones. Although it is an indigenous American snack, it originally was not a snack food, but was pounded into a meal and mixed with water. This same cooking technique was used by the early American colonists, who mixed ground popcorn with milk and ate it for breakfast. Popcorn is a whole grain food. Here’s the history of popcorn.